I can barely remember the last time I enjoyed some good chicken wings. It must have been atleast over 4 years ago when my brother whipped up some at a family BBQ. I had a big hankering for some and picked up some Chicken Wings the other day. Now, I do know how my brother makes his version but I thought it would be a good idea for him to do a guest post around here sometime. Now I just need to get him to do it. Anyway, I wanted to try making something different and when I came across this recipe, it was a no brainer. I mean it has a concoction called Angry Sauce. How cool is that! I was really excited to try it out. The recipe seemed fairly simple. What I really loved about it is that the wings are baked. There is no frying involved. Yet, you are left with a beautiful crispy skin on the wings and that is just how I like it. It does make this recipe healthier. They are then dunked in a flavorful sauce and tossed. What you end up with is a really tasty, sticky plate of wings that is bound to be a hit at your next party or gathering. There is hardly any hands on time required for this recipe which makes it perfect for a party. And that Angry sauce is so good, a little spicy, tangy and sweet all at the same time. Yummmm. I do hope you try this recipe out. And if you do, I'd love to hear what you think of it. Toss the wings in the olive oil and sprinkle salt and pepper. Toss well to make sure all the wings are well coated. Place the wings skin side up on the prepared baking tray and bake for about 40-45 minutes until they are cooked through and the skin is crisp. 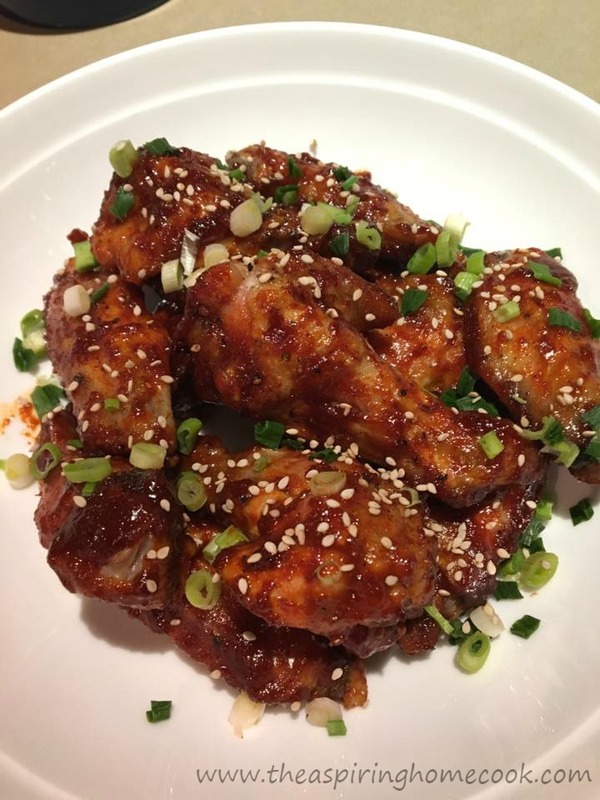 While the wings are baking, in a small bowl, mix the rest of the ingredients for the sauce, except the spring onion and sesame seeds. If the sauce is too thick, add a little more water to thin it down a little. Taste the sauce and adjust the spice, salt, sweetness or sourness, as needed. Drain off any fat that has rendered from the wings while baking, and toss the wings in the sauce till it is well coated. Sprinkle with the spring onion and sesame seeds. *** This post is not a sponsored post and I haven't received any compensation from either Marco's or Woolworths.